In 24 years as Maricopa County Sheriff Joe Arpaio built a national reputation and often billed himself as America's toughest sheriff. He was re-elected six times before a defeat in 2016. A lot of his reputation came from tough immigration enforcement. Immigration is one of his favorite issues but he says it's not his only issue. "Well, naturally, it's not just the illegal immigration and the drug trafficking crime. We have the economy that's a big issue right now, especially between Mexico and the US. I've always said in my career that I would hope that Mexico could build up their economy that would keep people from Mexico coming here illegally to obtain jobs." We asked Arpaio about the controversy when the Federal government separated children from adults found crossing the border, or adults who came to the border and asked for asylum. "First of all, I agree with the Attorney General; zero tolerance, you come across that border, you will be charged. And it's just like when we charge people here, parents or what have you, you take the kids and you have to process them through another avenue. So that's something that has to be done, if the parent comes in here, the kids are with them, and you have to do something with the kids." Arpaio is proud he was one of Donald Trump's earliest supporters. He says he supports the President's policies foreign and domestic. Trump pardoned Arpaio after Arpaio was convicted of a misdemeanor criminal contempt of court charge. It was for violating a court order to stop his deputies from profiling latinos. 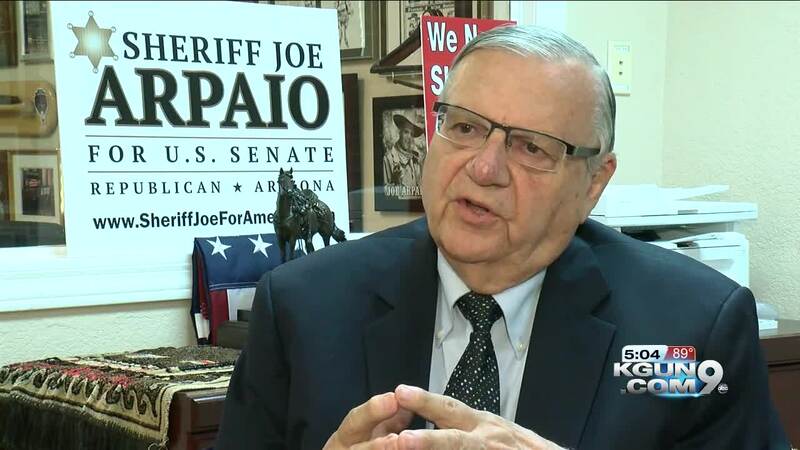 But if Arpaio does become a Senator would he feel obligated to vote Trump's way? "I'm not a rubber stamp anybody knows my history knows I go against the grain there is no rubber stamp I don't have a stamp I do what's right for the people." And now the people get a chance to decide if Joe Arpaio is right for the Senate.